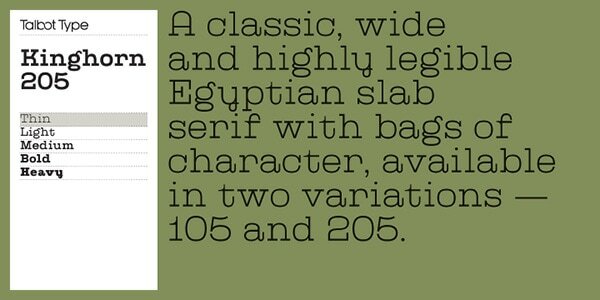 The early 1800 saw the birth of the Egyptian typeface, technically known as Slab serif. The term Egyptian was deemed by others as a misnomer, in which it was derived from the craze the country made after the 3 year expedition of Napoleon. It seemed like it was the most convenient term and because of its popularity, has become the nomenclature for the typeface. The birthplace of Slab Serif was Britain in which print advertising was still very popular. The radical advances in advertising strategies inspired this bold new typeface. Typeface was initially geared towards long stretches of texts like in newspapers and in books, but with the changes in innovation as well as increase in the prevalence of advertising; the need for a typeface that shouts at the person and stands out amongst the crowd became essential. Posters have to shout and billboards have to scream. Even if slab serif was a young innovation compared to other typefaces, it also is one of the constantly changing and innovating typefaces, adapting to consumer need and changes in aesthetics. 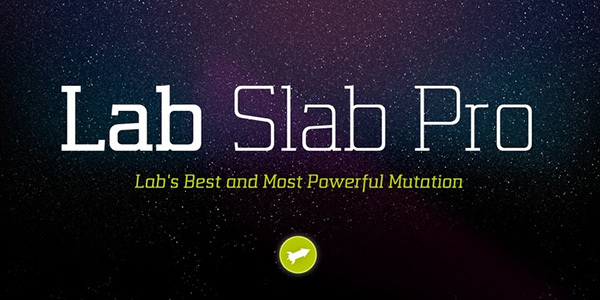 Slab serif carries a very prominent form: slab-like, bold, and square cut fonts. In the first few decades of the 19th century, radical developments in typography would result to three prominent typeface varieties including sans serif, fat faces, and the slab serif. The actual origins of this typeface are hard to determine but experts agree it came from signwriting. Based on an analysis by James Mosely, it wasn’t until Figgins’ first Egyptian printing type appeared that a true slab-serif typeface existed. The first iteration was in upper case letters only and the serifs are thick as the main letter strokes. 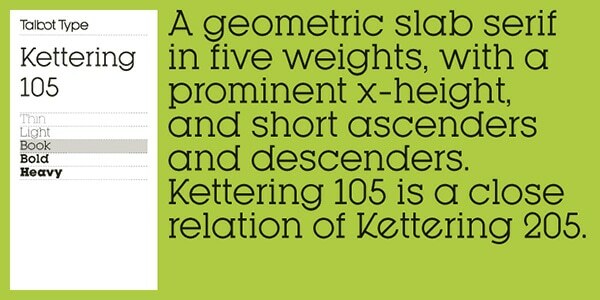 Based on an 1823 specimen by Figgins, experts believed that slab serif was indeed based on fat faces. The capital letters may carry consistent modulations but with small letters, the modulations were varied, loosely based on the fat faces. 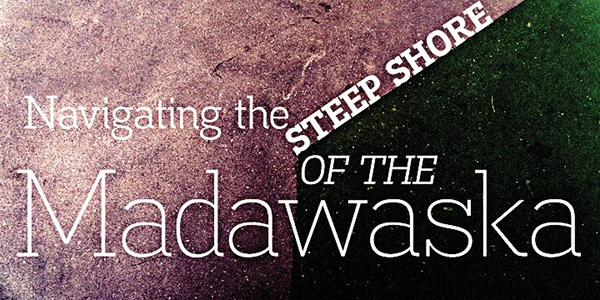 Like many other revolutionary and unique typographies, the slab serif met disdain and callous remarks from critics. Even those from typefoundries felt that it may be too much. Figgins continues development of slab-serif in which italics on capital letters were introduced in 1821 while further developments of the small letters have been introduced in 1825. A few years on, the slab serif has become commonplace as emphasis for typographic data such as headings or as bold type within texts. 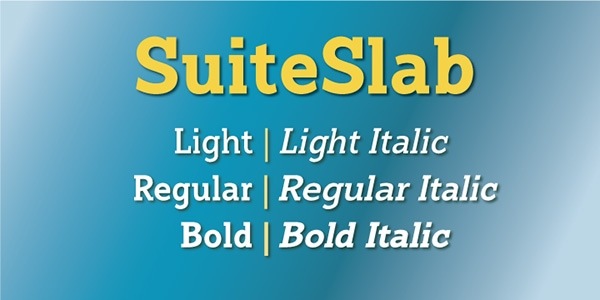 Slab Serif began gaining traction in the industry. 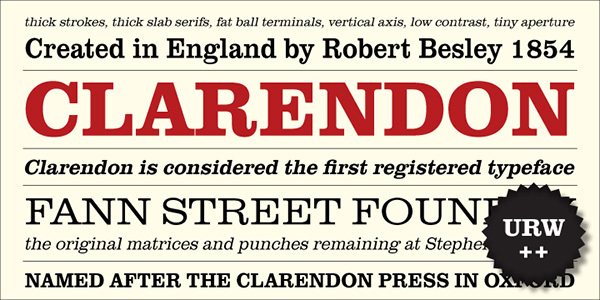 By 1845, the Clarendon, a sub-category of the Slab-serif has emerged and carries a distinct appeal due to its gentler form. The modulations between thick and thin are present as well as bracketed serifs and stress on verticals. Another popular version was the Ionic which carries a robust appeal which is why it was preferred for news printing. At the end of the 19th century, there has been a considerable disuse and unpopularity towards the use of Egyptian Slab serif. During the early 20th century especially the 1920s, sans serif became the typeface for its no-nonsense, utilitarian appeal. It was until the 1930s when slab serif would become visible again. The Golden Type by William Morris can be attributed as the seed that would reincarnate the slab serif. While Morris claim that the roman type from Jenson was its basis, the slab serif was very much present on the typeface. 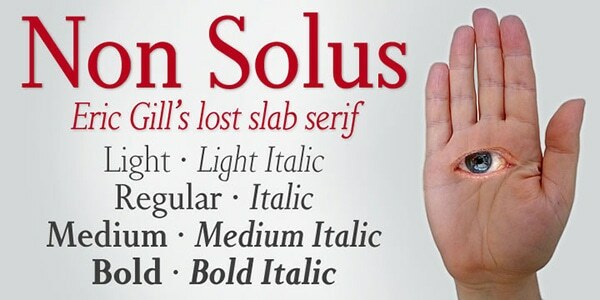 In 1929, Eric Gill would create Solus which would firmly plant Slab serif revival. While the creation of Solus was to try and balance readability and design issues of Slab serif, the advertising market still snubbed the said typeface since it did not carry that Egyptian blackness and it was not able to fully transfigure the 19th century form for 20th century needs. Compared to the 19th century ones, the 1930 Slab serifs have modulating thin and thick strokes with more humanist proportions. Sadly, since the focus of Gill’s work were for readability, they tend to be more ideal for texts compared to advertising. If Gill did not appease the advertising market, the Germans would have a profound interest in it. 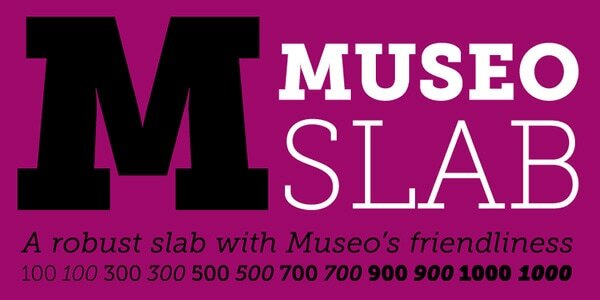 With a different approach, particularly of a modernist kind, Slab serif would enter a different type of type with the Memphis, created by Stempel. This style is monolinear in form but with slight curves along the adjoinment to prevent the areas from becoming too black. This unique approach to slab serif made it successful. During the 1930s, the Germans dominated in reviving the slab serif with Britain and America following suit. 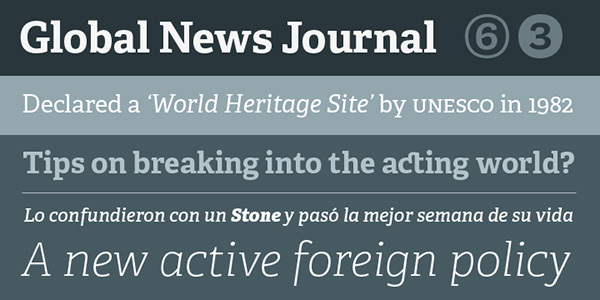 The new slab serif styles were designed for both continuous and display texts. However, their popularity was still overshadowed by prominent sans serif because of the popularity of modernistic design. Monolinearity and geometric forms present in slab serif were more reminiscent of the machine age than contemporary age and that is why some consider that it cannot be relevant for continuous text. 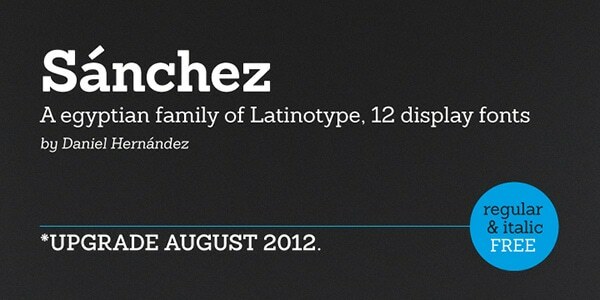 Sanchez was created on the basis of one of the most popular typefaces, called Rockwell. The author has improved square letterforms with the help of smooth rounded edges thereby striking the optimal balance that contributes to contrast and readability. The family can be broken into two groups (Regular and Condensed). Together they embrace twelve weights, from slim to bold, upright and italic variants, and a ton of glyphs. The font is an alliance of squared and rounded forms that result in an outstanding typeface with piquancy. It is saturated with an industrial vibe and has a subtle steampunk note and masculine appeal. Although it fits like a glove into Victorian style artworks, however, it can go perfectly well with modern projects. 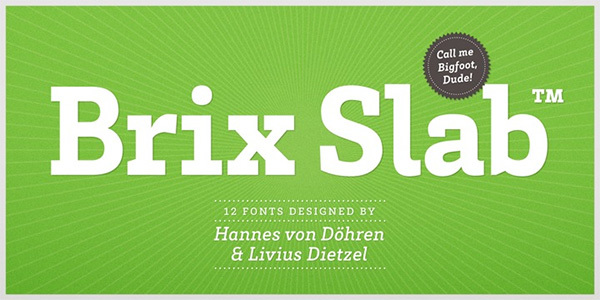 The product includes twelve variants covering regular and italic styles, and several weights. As for glyph coverage, you can be sure that it will be enough to satisfy your needs. 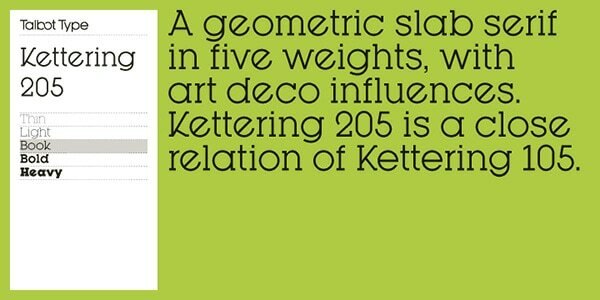 Kettering 105 is a classic geometric typeface with optimized kerning and well-thought-out spacing. Thanks to some enhancements made in ascenders and descenders, the lettering that is set in this font looks compact, natural and eye-pleasing. It is also quite universal, coming in handy for both text and titles. You can manipulate with five weights (Thin, Light, Book, Bold, and Heavy), and a vast amount of symbols, in which you can find ligatures, an essential set of characters, punctuation marks, and some others. Originated from the 30s, this beautiful slab-serif typeface is defined by elegant shapes and art-deco tone. While the bold version is well-suited to put emphasis on headlines, the light version can be used to display long copy. It also has an upright and italic version. The glyph coverage enables you to write in numerous languages, including CE ones. This traditional slab-serif font is enriched with some original touches that add to its decorative nature. It is elegant, geometric and monoline. 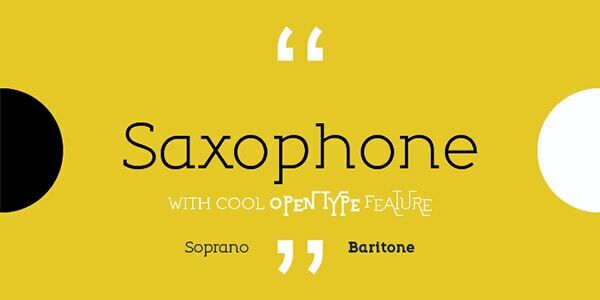 Its main advantage lies in its OpenType features that are full of surprises. You will find in here original and inventive alternates, ligatures and numbers. There are two primary weights: Regular and Bold. It is applicable for both headlines and content. This is a condensed version of the first example in our collection. While its roots also lie at Rockwell Type family, it still has its characteristic traits, which make it excel from the others. Ranging from the ultra narrow to extra bold, it has weights for every taste. It is also presented in upright and italic version. As you can see, the author has prepared lots of room for improvisation. and a collection of glyphs that comprises small caps, numerals, ligatures, accented characters, fractions and others. Trivia Slab magnetizes with its unique typographic features that embrace various versions of letters. Some of them bear a businesslike nature while others are bursting with artistic flavor. Unlike the majority listed above, this product thanks to an extended set of glyphs (which includes Greek and Cyrillic symbols) is able to support numerous languages, including Central and Eastern European ones both presented in uppercase and lowercase modes. And that’s not all, there are numerals and scientific figures as well. How about a typical geometric slab-serif typeface with a twist? The Kettering 205 is one of such kind. Although it is a standard font composed of sharp shapes and circles, it has a spirit of Art Deco era that gives it a particular charm, letting blend into an environment with retro-futuristic, artistic and even techno air. It is also pretty versatile so that you can apply it to titles and content. 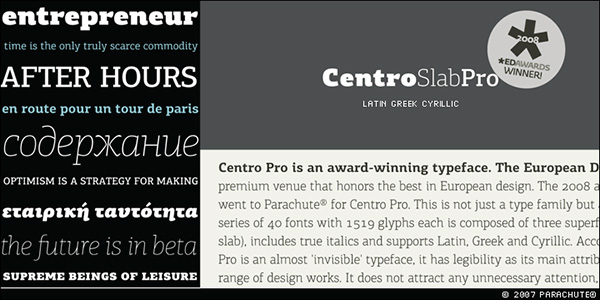 There are five weights that are available in Regular and Oblique styles. and an enormous pack of glyphs that comprises accented symbols to speak in Western European languages. 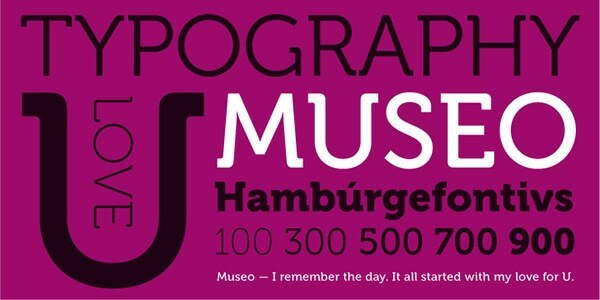 Museo Slab exudes an image of very friendly typeface that can add warmth to artworks. Set in bold, it produces an overwhelming effect, naturally highlighting any title and giving it an extra visual weight. 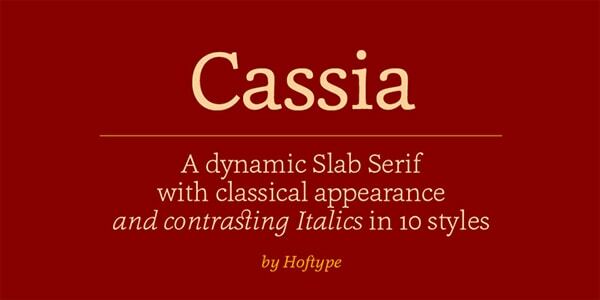 It is presented in six weights and upright and italic styles. 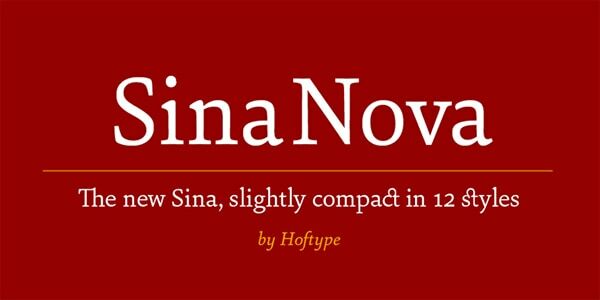 It possesses all the standard OpenType features and supports various Latin-based languages. As a result, you can write in over 40 languages. With such a huge arsenal, it is not surprising that it supports a majority of CE languages. It provides owners with a multi-language support. 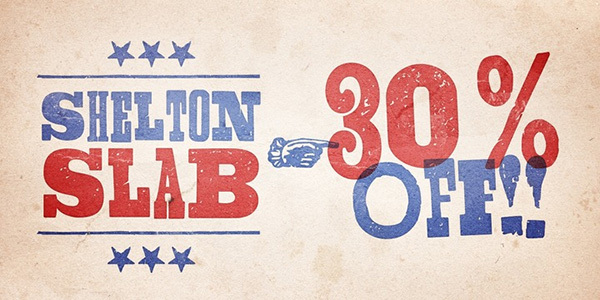 Shelton Slab is a traditional authentic geometric slab serif typeface that was skillfully enriched with grunge touches, bold forms, and whimsical notes. As a result, it has a robust architecture and bizarre behavior. It is also saturated with old-fashioned look and feeling of Wild West. Its characteristic trait is that all letters do not look alike: in such a way author has added to the product a playful mood. Although it ships just in one option, yet it is sufficient to give any poster design a nice old-timey spice. 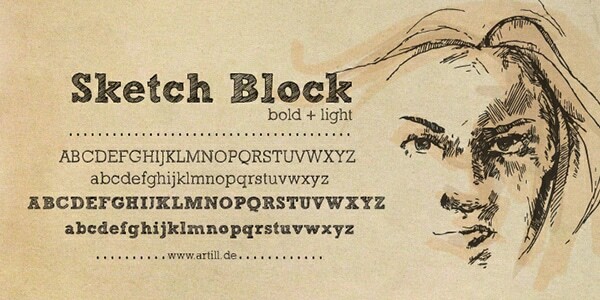 Sketch Block is a hand-sketched typeface that mimics human writing. It is a bit decorative, and at the same time, brutal. There are two weights. When used in tandem, they are capable of producing an outstanding result. Although they are applicable just for headlines, however, they do their job perfectly well, placing any title into a dominant position. Each one is available in two formats: OTF and TTF, and five licensing options. 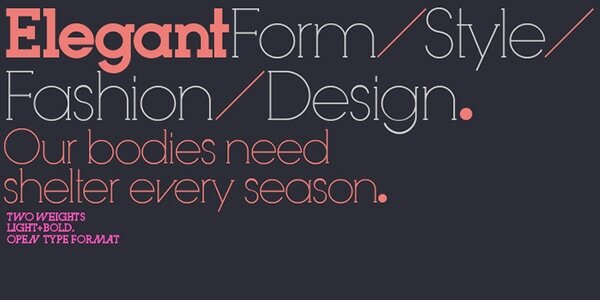 Inlove is a refreshing take on a standard slab-serif typeface. Although the product preserves its geometric nature, yet it looks increasingly delicate and exquisite. It is slim, elegant and a bit fancy thanks to diagonal lines that mark several letters. It is delivered in two weights (light and bold), and one style. As for typographic features, they are pretty standard. URW Clarendon lets instill a subtle sense of nostalgia in the artwork. 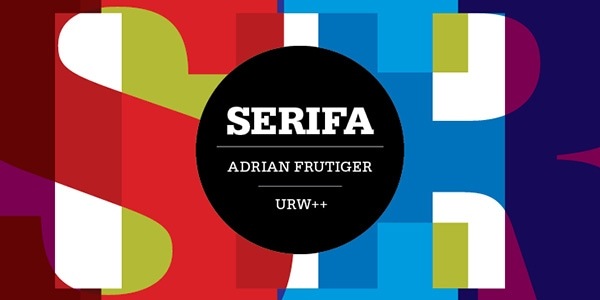 It combines traits of retro and modernity resulting in a typeface with a twist. It works excellently as an ordinary and display font. Thanks to relatively wide letterforms, each character looks legible and sharp. There are almost fifty styles that can be broken into two categories: regular and oblique, and a lot of glyphs. Created by Adrian Frutiger, this massive and bulky typeface is enriched with a retro feeling of the 60s. Paired with bright flat coloring it is able to achieve the greatest output. The family has almost twenty items each of which has a ton of standard and special glyphs that let the product support different languages. Along with basic styles that include regular, thin, bold and others, there are several decorative and offbeat variants that take titles to the whole new level. 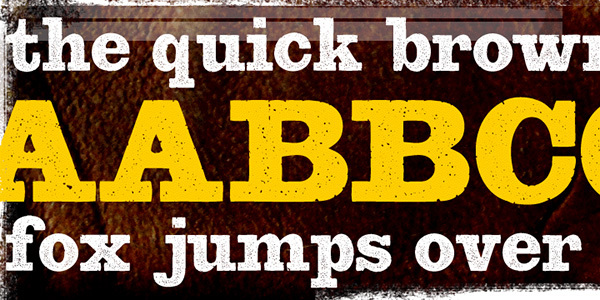 Any lettering set in this typeface will jump out at you with its heavy and solid look. 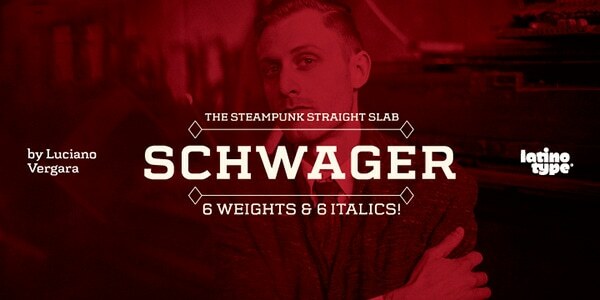 The aesthetics of the font is centered around European industrial period so that it is a bit rough and rustic. However, it is not deprived of beauty. It consists of all the letters of Latin and Cyrillic alphabet as well as digits and punctuation marks. 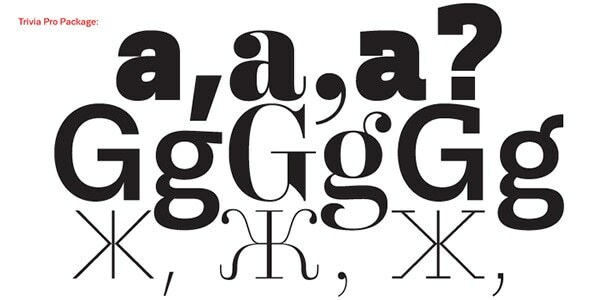 It is available in two basic formats (OTF and TTF) and one regular upright style. The product gets the feel of Wild-Wild West period from its rustic, quirky, whimsical and a bit strange letterforms. It may only seem that font was not optimized. Indeed, everything was carefully planned and made with attention to detail. The author offers five versions (Deputy, Sheriff, Blend zone, Blend Two, and Pictures), each of which has its personality and a mixture of characters. The only drawback is that the list of typographic features is pretty poor so that you can employ it only for limited projects. 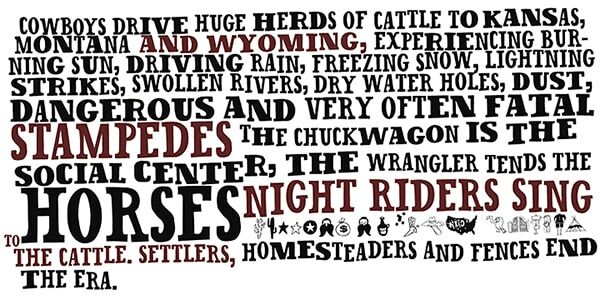 Much like the previous example, this bulky typeface has a spirit of Wild West. This characteristic trait goes perfectly well with designs for outdoor restaurants, BBQ restaurants, and others. It feels comfortable on the top of natural textures, such as wood. The author has prepared two versions that are available in OTF format and include characters to write in Eastern European and Baltic languages and a small collection of old-fashioned figures and signs to finish off projects. Although the typeface is not destined to bring readers’ attention to titles, yet it works great as a font for displaying long texts. It looks smooth, soft and radiates of warmth. It is offered in two styles (upright and italic) and three weights (Light, Regular, and Bold). The glyph coverage is standard; it means that you can write mainly in English and several Roman-based languages. One of the best slab serifs used today is the Archer which is good enough for extended texts. 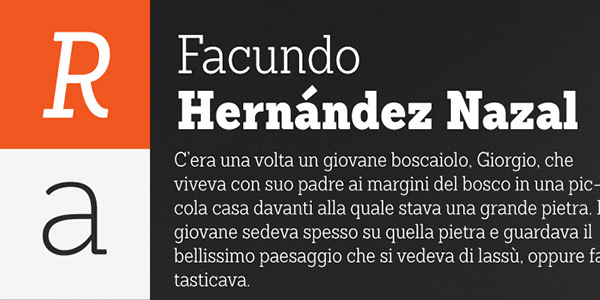 The Officina serif also carries a robust appeal that would look well on paper. A very popular one, used by Milton Glaser, was the ITC American Typewriter, used in the iconic I Heart New York Logo. The great thing about these types is that they work well even on poor quality paper.